The oft-delayed Gearbox title is heading to retail next year. After years in development, Sega has announced that Aliens: Colonial Marines will be stepping out of the shadows and onto retail shelves worldwide on February 12, 2013. Colonial Marines is a first-person shooter casting players as - you guessed it - a Colonial Marine in the fight against the Alien scourge. Following the events of Alien 3, Colonial Marines will see players traipsing through familiar Alien locations as they search for series heroine and all-around badass Ellen Ripley. 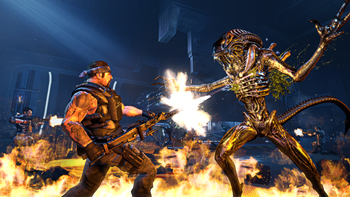 The game is extremely anticipated amongst fans of the Alien franchise due to the fact that 20th Century Fox has made the game's plot, penned by some former Battlestar Galactica writers, a part of the official Alien canon. Regarding the first Alien film, Ridley Scott said, "The most important thing in a film of this type is not what you see, but the effect of what you think you saw." In regards to Colonial Marines, I've seen only missed launches leading to nothing but the community's repeated disappointment. Here's hoping they don't miss this one. Though the February 12, 2013 date for Colonial Marines is official, that date only applies to the PS3, Xbox 360 and PC versions of the game. A final date for the Wii U version of the game has yet to be announced.